Oh, Brides, what are you DOING? Yesterday, it was brought to attention that Brides Magazine had an article circulating the cloud. The article in question? 10 Muslim Wedding Ceremony Rituals and Traditions, Explained. Sounds innocent enough, right? In this age of miscommunication, and persistent miscomprehension of each other’s cultures, this is the type of journalistic attempts at bridging the cultural gap we want, nay, NEED. Right? WRONG. What Brides Magazine has here is an outrageous list of generalizations from traditionally Indian or Pakistani weddings, which they have synonymized with what they are inexplicably calling “Muslim Wedding Ceremony Ritual and Traditions.” Because generalizing 1.8 billion people under the same umbrella always works out so well, doesn’t it? 1. I get to stay home for a week before my wedding a.k.a. the most stressful time of my matrimony?! Can someone CC my aunties? So, here’s the issue. We haven’t found even one culture that insists a bride avoid leaving her abode in the week preceding her wedding. In my personal experience, that week is laden with activity, and no one, not even the bride, can afford to take it easy. 2. Sorry, I didn’t realize 1.8 billion Muslims all wore saris and lehengas. Saris and lehengas are traditionally Pakistani and Indian garments. They don’t actually feature in EVERY SINGLE Muslim wedding around the globe. I can’t believe I have to say this. 3. Can I re-do my wedding, because I never got my elephant ride. Once again, Brides seems to be conflating “Muslim” and “Indian,” because as far as I’m aware, elephants only really feature in Hindu weddings. Islamically-speaking, the shaykh needs to hear the bride agree to the marriage. If your wedding went any differently, then we need to be having an entirely separate conversation. This is one of the less light-hearted, more insidious implications of the misguided summary in Brides. 5. All Muslims, from every culture, wear red and gold? How unoriginal. GET IT TOGETHER, YOU GUYS! Red and gold are traditionally Pakistani/Indian wedding colors, and have NOTHING to do with Muslim weddings in general. Additionally, as time goes on, more South Asian brides are eschewing the cultural norm of wearing red to their weddings, in favor of other colors to show off their individuality. 6. Miss me with that dupatta. It’s heavy, and it hurts! So, once again, the dupatta is an Indian and Pakistani concept, and doesn’t actually feature in any other Muslim wedding norm. Am I starting to sound like a broken record, yet? (And yes, from personal experience, the dupatta IS heavy, and it DOES hurt. Fight me). 7. Again, ALL Muslim grooms, from EVERY diverse culture, wear sherwanis, the traditional coat-like garment that originates from India and Pakistan? Ah, the noble sherwani. Yet another Indian and Pakistani garment filed away under the inexplicably broad category of “Muslim Wedding Traditions”. Just to be crystal clear, you’re unlikely to find a sherwani-donning groom anywhere other than a Pakistani, or Indian wedding. 8. Consummation of marriage? More like, consumption of mass amounts of food, amiright? 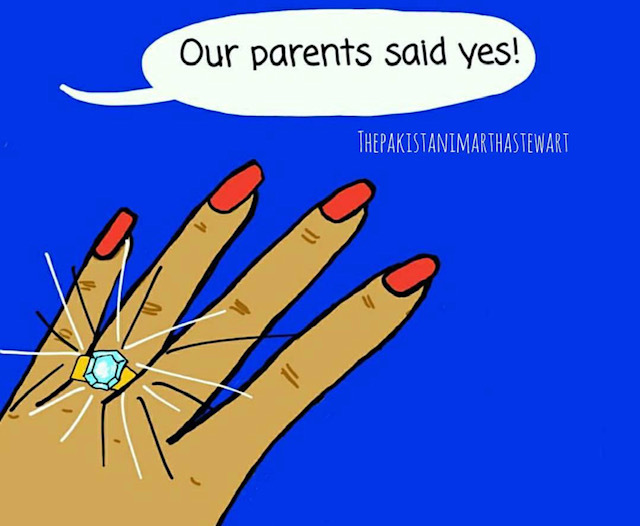 The valima, yet ANOTHER term that applies exclusively to Pakistani and Indian weddings, rather than Muslim weddings as a whole. In all seriousness, to conflate Pakistani or Indian matrimonial concepts under the generalization of “Muslim” traditions and rituals, something that could easily be Googled, or DOUBLE-CHECKED with an individual actually immersed in those cultural norms, is unacceptable, particularly in this day and age. There is far too much misrepresentation out there already, and what we don’t need is a badly-researched, blasé article about matrimonial traditions that dismisses and diminishes the diversity of 1.8 billion Muslims into a neat little mix that’s easy for consumption. Do you have a story to tell about YOUR “Muslim” wedding? Tell us about it by tagging us in #MyMuslimWedding on Twitter!